The day and night 360° anti-aging duo. L’Eau de Jour is a revolutionary anti-aging spray that stimulates the skin’s natural production of hyaluronic acid, collagen and elastin for visibly younger skin and a “syringe alternative.” L’Eau de Jour acts like an invisible shield against pollution and UV rays while maintaining a radiant complexion. L’Eau de Nuit contains a unique combination of active ingredients that help to reinforce the skin’s natural detoxifying powers while stimulating regeneration and preparing it for the next day’s onslaught of UV rays. L’Eau de Nuit instantly hydrates the skin and offers an immediate sensation of relaxation and comfort. Please refer to the product fact sheet of L'Eau de Jour & de L'Eau de Nuit. 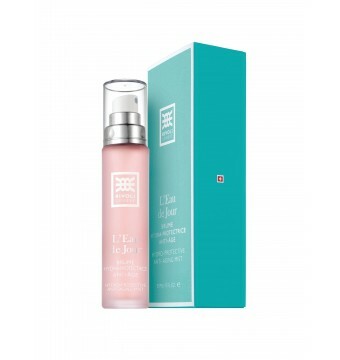 L'Eau de Jour Hydro-Protectice Anti-Aging Mist : every morning, spray under or on top of your day cream or your make-up. Re-apply during the day when the skin feels tight, tired, or in need of a boost. L'Eau de Nuit Revitalizing Mist: spray evenly on a cleansed face, neck and neckline every evening before going to bed.